We have at our disposal 86,400 seconds every single day, we only get them once and when they are gone they are gone forever. Unlike money, which we can all earn money, spend and then go earn again. Once our time has been spent it cannot be replaced. 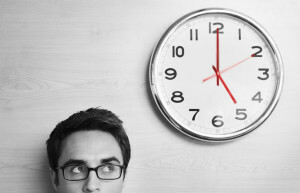 Becoming more efficient with our use of time is a vital key being successful in business. Set clear goals and objectives (using SMART). Set a daily work plan (the night before). Prioritise tasks using A,B,C,D,E (consider the consequences in setting priorities). Reprioritise A tasks using 1,2,3 to identify the most important A tasks and so on. Separate the urgent from the important (what are the long term potential consequences of doing not doing tasks?). Use the law of forced efficiency (what is the highest value use of your time, right now?). Use the 80/20 rule to identify the 20% of tasks that will have the greatest benefit and just do those. Develop stamina and high energy through proper exercise, diet and rest. Develop single-handling skills to concentrate on one task at a time. Eat that Frog (do the hardest task of the day first – don’t sit and look at it or procrastinate – just DO IT!). Organise your work workspace (don’t work in a mess). Use the acronym TRAF – Toss, Refer (delegate), Action and File to help you (See paperwork tip). Use travel time effectively (listen to CDs, prepare a work schedule for flights/rail journeys). Develop expertise in key tasks through practice and repetition. Work in ‘real’ time (pick up the tempo, develop a sense of urgency, do it NOW!). Learn to make decisions quickly; don’t carry ifs, buts, and maybes around. Reengineer work processes: map them out and identify what needs to be done to reduce the number of steps by 30% minimum. Reinvent yourself at least once a year: identify what you need to do to become more productive, because everything changes (90 day plan). Ask yourself this on a regular basis: knowing what I know right now, would I be doing this/be in this relationship/working with this client etc. Decide to work to live, not live to work. This means working towards a balanced life. It’s the quantity of time on downtime and the quality of time at work to aim for. Be Intensely Action Orientated. It’s acting and executing that generates results.